The fabric on a local church showed the wear from almost 20 years of services. Stains and thin spots gave a dowdy look that was hard to ignore. After a sticker shock from a NJ 'church interiors' company, the manager asked us to make a proposal. 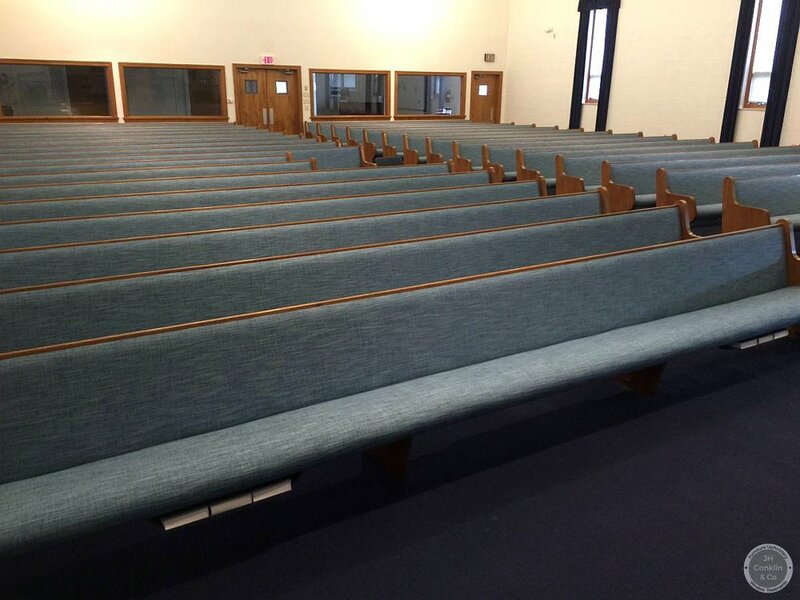 The church had 39 pews - most of them 16 feet long. The seats and inside backs needed recovering. The pews could only be out of service from Monday through Friday. Selecting the fabric was a balance of color, durabilty and cost. The trustees wanted a color similar to the existing fabric because the outside backs were intact, so we got a sample cutting from one of the seats for reference. We spun through several fabric houses, picking possible choices in the color which were also rated as 'heavy duty'. We sent samples to the secretary. The trustees picked a fabric from Carole Fabrics - pattern Yardley color Ocean. It is 100% polyester, making it good for stain resistance and with a durability rating of 50,000 - solidly heavy duty. It also looks nice, with a slubby textured weave. 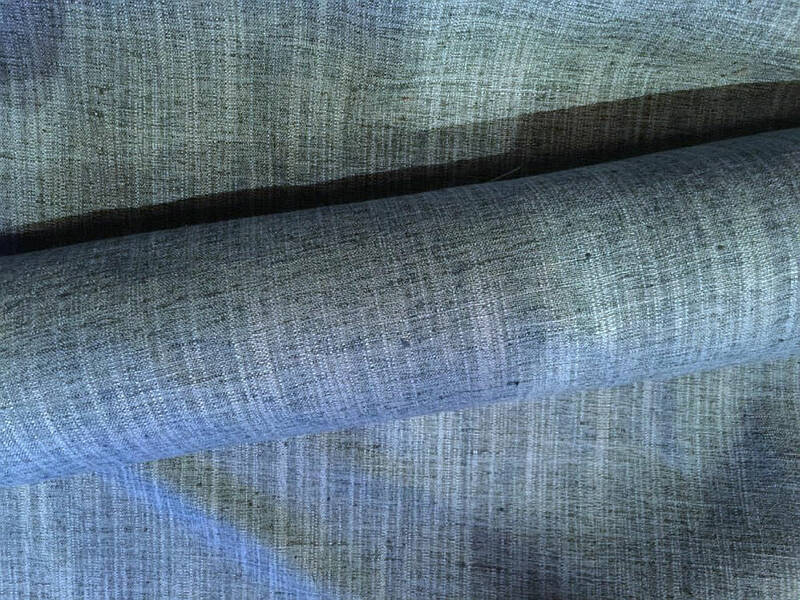 The fabric retails at $48.70 per yard which we discounted at 25% giving the church a cost of $36.53 per yard. Each full length pew required 6 yards. To ensure continuous service, we split the work into two week-long phases with our field team and shop team scheduled in advance with a one day safety margin. Early Monday morning, the field crew removed the padded parts of the pews: unscrewing the components, labeling them and loading them in the trailer. The book trays remained in place because we were not recovering those sections. As you can see, it took some crawling around on the floor and then a bunch of carrying. I was with the field crew and then off to other locations, so shop photos of the re-covering work didn't happen. But a lot of prying out old staples and cutting and fitting did happen. A few of the pieces were too long to fit in the truck, so part of the upholstery team came to the church to do the work on site. Fitting the newly upholstered pieces back in place took longer than the removal. The field team developed a sequence to assure proper alignment and screwed all the pieces back together. Then the clean up. Cutting off any exposed threads, reconnecting the PA wiring, touching up any scratches on the wood and, finally, vacuuming up all the chibbles and bits. The result, after two weeks, is a nice fresh look ready for an appreciative congregation. The folks at the church were great - even giving us a spare key so we could get there early and stay late as needed. The furniture workshop at JH Conklin & Co. reupholsters and refinishes furniture for people and businesses throughout Southern New Jersey, Delaware, Philadelphia metro and the southern shore areas. The workshop also provides custom Roman shades and fabric resources. Newer PostWhy Do Upholstery Shops Charge Cutting Fees?